A rainy evening, a plate of hot and divine Batata vada with your favorite cuppa tea and lots of Gup Shupp. Wow! I yearn for these special evening and you already know what makes it special. YASS! So basically Batata Vada, also known as aloo bonda, is a popular Maharashtrian snack made of deep-fried potato dumplings covered with chickpea batter. A perfect snack to munch on when the cravings kick in, the pillow insides and crunchy outside makes it a quite a rage. It’s impossible to eat them every day from vendors or markets. The recipe that I have today is super easy and these vadas will taste like they have come straight from a shop. Pack it between the Pav or eat them as is. Keep Calm and let’s make some awesome Batata Vada! In mixing bowl add gram flour, rice flour, ¼ tsp turmeric powder, salt to taste and chopped coriander leaves (optional). Add water in batches to prepare a semi thick batter. Heat a pan and pour oil. Add dried red chili, lower the flame and add mustard seeds. After you hear the pop add cumin seeds, sesame seeds, and curry leaves. Now add ginger garlic paste, crushed green chilies and mix well. Cook for a minute. On a low flame add turmeric powder, asafetida, black salt, red chili powder, Garam masala and finally chat masala. Now add the boiled pieces of potatoes and mix well. On low flame cook for a minute. Next mash the potatoes in the pan itself, add dry mango powder, chopped coriander leaves, salt to taste and mix well. Let it cool down. Taking a spoonful of stuffing in the palms roll it smoothly into a ball. Dribble a spoonful of hot oil in the batter and mix well. This will give the perfect crunch to Batata Vadas. 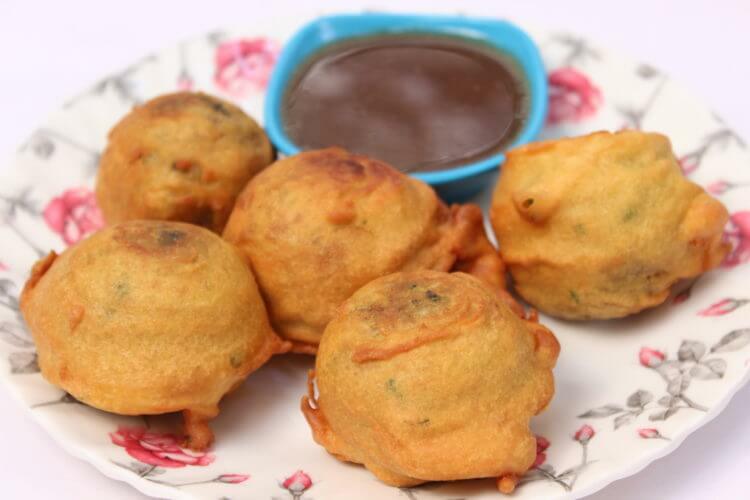 Dip the Batata vada in batter and gently slide them into the hot oil. Fry on the medium-high flame and until light-golden in color from all sides. Take them on a kitchen towel lined plate. You should serve them piping hot with ketchup or home-made green chutney. 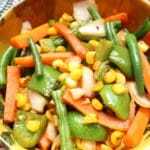 A great supper dish to enjoy with family and friends. Do try in your kitchen. Share your cooking experience with me. Keep posting your comments and valuable feedback. Gram flour and potatoes are the main ingredient of Batata vada. If you are allergic to Gram flour than you can use fine semolina and rice flour mixture. It will taste different than regular batata vada but you will gonna like it. If you don’t like only semolina taste than you can add little wheat flour and rice flour also.